Urban circus promotions and event hosting services. We have been involved with promoting products directly to the public for many years. Having a highly visible character drawing attention to your current campaign can quite certainly have positive results on your footfall. Urban Circus promoting 'Comedy Downloads' in Dundee and Perth. Eric was a star creating a great buzz outside our store. Comments: Very happy with performance. There was visual confirmation by increased footfall, customers bringing leaflets into store and taking connections. Creating a buzz with an angle grinder on stilts was a fantastic success for a nightclub in Edinburgh. 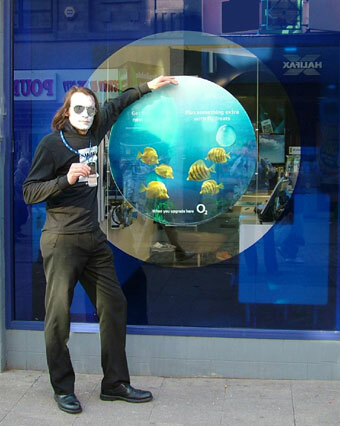 Highly visual and guarantees an audience collecting outside your venue. Need a Compere / Presenter ? Fashion shows Award ceremonies Sporting events. - Comedians Magicians Pipe bands kids entertainment face painters. - Pro-active Promo staff Leafleters Scotlands best models. - Audio Visual Requirements PA, Staging and lighting hire. - Caterers and mobile bar . - Fireworks and Pyrotechnics Fun games and inflatables. Telephone On-hold music and messages. Retail adverts + messages / Voice Evacuation. Custom made voice over messages on CD or file/mp3 format. Are you looking to promote your business? Having your product balanced on John Evans head certainly gets attention! John offers various forms of advertising and sponsorship. 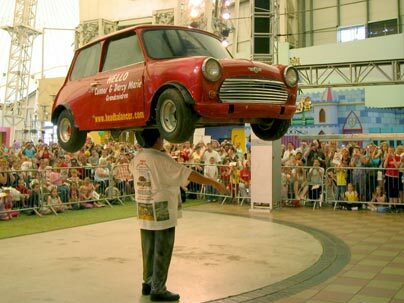 Your business can be promoted on the Mini, the most famous part of his show and unique to John, for a whole year. It can be a great way to advertise - John's international recognition makes his act a good place to gain global exposure for your business. "Thank you Urban Circus for great performances on the roadshow. We were all really impressed by your flexibility and professionalism for all 16 events! All the best for 2007."